We recently announced that Martin Leon, MD, one of the preeminent thought leaders in the field of interventional cardiology, has joined the company as an external consultant and executive advisor. 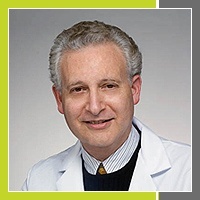 Dr. Leon is the Director of the Center for Interventional Vascular Therapy, Director of the Cardiac Catheterization Laboratories, and an Executive board member of the New York-Presbyterian Heart Valve Center. As an external consultant and executive advisor for Corindus, Dr. Leon will advise the Corindus executive team on technology development, clinical research strategy, and growth strategy including partnerships and alliances. 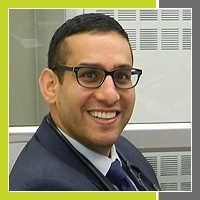 In a recent issue of Diagnostic & Interventional Cardiology, Dr. Amir Kaki (Detroit Medical Center) discussed his experience performing robotic-assisted PCI via radial access and the benefits it affords healthcare workers and patients. Adoption of radial access continues to grow in the United States and has been shown to have benefits for patients. 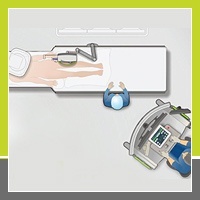 Combining this technique with new technologies such as robotics allows healthcare workers to reduce their occupational risk while providing a high level of care to their patients. A recent study in the journal Circulation: Cardiovascular Interventions highlights new findings on the occupational health risks of working in the cath lab. The study was based on a survey of over 700 medical professionals of which more than half were exposed to radiation in their careers. The study found a significant increase in the presence of skin lesions, orthopedic illness, cataracts, hypertension, and high cholesterol in the exposed group versus the non-exposed group. 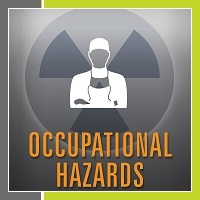 This study highlights the serious risks these healthcare workers face. Solutions such as CorPath provide an opportunity to reduce these risks while providing a high level of patient care. Earlier this month, Corindus participated in the American College of Cardiology’s Annual Scientific Sessions in Chicago, IL. The meeting featured top research in both general and interventional cardiology including updates on the latest studies and trends. Attendees of the conference were able to experience complex robotic-assisted PCI with an advanced simulator to give attendees a “real-life” experience of how robotics will fit into their lab. In addition to the hands-on experience for attendees, there were 3 abstracts on robotics on display in the poster sessions, a talk on how robotics fits into optimizing PCI care processes, and a robotic PCI physician users meeting where CorPath users discussed best practices and the future of robotics in the cath lab. In this case, Dr. Amir Kaki performed robotic-assisted PCI via radial access for an 80% occlusion of the left circumflex (LCX) artery. Dr. Kaki noted that radial PCI with robotic assistance can be performed in such a way as to provide benefits to both patients and providers. Late Breaking Trial: Demonstration of the Safety and Feasibility of Robotically Assisted Percutaneous Coronary Intervention in Complex Coronary Lesions: Results of the Complex Robotically Assisted Percutaneous Coronary Intervention (CORA-PCI) Trial. Does Robotic Percutaneous Coronary Intervention Lower Stent use Compared to the Manual Approach? 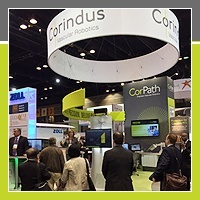 You received this email because you are subscribed to Marketing Information from Corindus Vascular Robotics.